Although not far from Washington, DC, we live in the fairly rural area of Calvert County. Like a lot of carnivals and fairs, there is always an animal exhibit featuring cows, sheep, pigs, and other assorted barn animals for show. Make sure to visit the animals either early in the morning or early evening, not during the hottest part of the day. There's better light too as the morning and evening sun, being low in the sky, will usually allow some nice light into the sides of the buildings (although this depends on your fair's facilities of course). It's a great opportunity to get up close because most of the animals are easily accessible from the walkways. You're also likely to find younger animals which is always a treat. Just watch yourself that an adventurous creature doesn't mistake your camera strap for a treat! Most fairs also have photo exhibits and competitions with entries submitted from local residents. Be sure to check out the results of the photo competition, you just might find a friend or two that won first place. My friend and fellow Calvert Photography Club member Bonnie Bryant achieved 5 first premium awards for her work. You can check out her award winning shots here (flamingo), here (lighthouse sunrise), and here (gorilla portrait). When it comes to the rides, this is where you can get very creative. I recommend timing your visit to cover sunset. 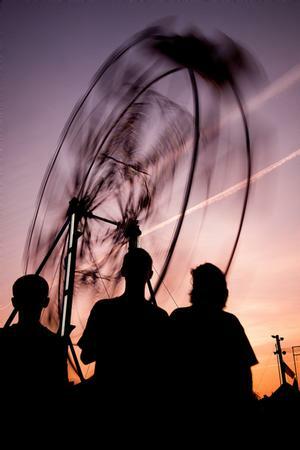 The sky colors in the late evening are perfect backdrops for the rides, it also becomes dark enough you can start to take longer exposures w/o the need for a neutral density filter. The shot at the left (0.6 sec., f/6.3, ISO640) was taken just as the sun was setting and in this case I did use an ND filter. After sunset the light is low enough a filter isn't required. The shot at the very top was taken w/o any filter at all. As long as you've got your tripod you can capture photos like this. I was originally trying to capture this Ferris wheel above w/o any people. I setup the tripod low to the ground and kept trying to time the shot between people walking by. I didn't have much time to work as the sun was setting quickly. Toward the end the kids came by and "accidentally" got in front of the shot after I'd triggered the shutter. I chimped to see and I'm so glad I did because I liked the shot with the silhouettes much better than I did by itself. So I asked them to stand still for a few moments while I recomposed and rattled off a few more shots. This one ended up being one of my favorites. The colors of sunset don't last long and then you're stuck with the dark skies. This is a time to concentrate on the lights of the rides themselves. 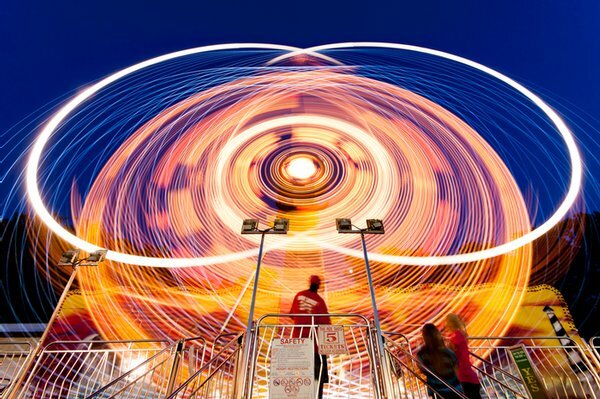 Ferris wheels and any ride that has changing light patterns can be a great subject. I took probably 20 shots of this ride below within a couple minutes and every one has a different light pattern. You never know what it'll look like...the pattern you see with your eye changes unpredictably once you push the exposure to 1 seconds or longer. Another thing you want to try for are the people shots. There is quite a variety of people you'll find at these events, lots of interesting and colorful folks. With so many people, it's also a great opportunity to capture the hustle of the movement with a slightly long exposure. Believe it or not, the shot at the left was a 2½ exposure (f/14, ISO 200, 10mm). The ride operator happened to be checking his phone just after measuring a child's height (and politely dismissing him because the kid was unfortunately too small to ride). When people stop to check their phone, they end up being remarkably still...the perfect time to trigger the shutter. I ended up really liking this shot because of the mixture of movement, from the total blur of the Ferris wheel to the crowd movement to the still parts of the structure and the operator. Not sure what it is, but this shot just oozes the fair and carnival feel more than any of the others. The lights in these environments are excellent backdrops for portraits and subjects with shallow depth of field. The bokeh can be spectacular, as in these two shots below taken with a 50mm prime...my favorite lens for bokeh and shallow DoF shots. The background blur in these shots is not the same as blur applied in post processing. If you're looking for photos with backgrounds like this you really need to get it right in the field as this effect is virtually impossible to recreate accurately on your computer. to keep the background completely out of focus. out more of the structure but still keeping it blurry. Subject isolation with a shallow depth of field. We stayed until the end, letting the kids ride the rides until we heard the official "we're closing" announcement over the loud speakers. I ended the evening waiting for the kids to finish their rides while the waxing gibbous moon came up over the trees. If you find yourself waiting for the kids to finish their rides (or maybe the adults are riding too! ), don't just stand around, keep your camera out and look around for opportunities. When you're stationary waiting, it's a great excuse to use your senses, do some people watching, or even shoot for the moon.